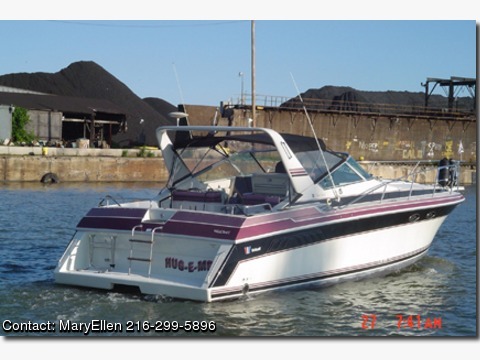 The twin Mercruiser 340 HP engines are water cooled and economical. I usually cruise at around 25mph but she will go much faster. The engines have approximately 896 hours on them. The Cockpit has a camper top with screens that are fully removable. It has a radar arch. Canvas is approximately 5 years old. There is also a mooring cover for storage. The Helm has a double wide bench seat, twin throttle & gear shift controls. A Garmin GPS, VHF radio, Compass. Across from the helm is a large L-shaped seat for passengers and at the stern there is a pull out bench seat that is completely across the boat. There is also a sink and an ice maker in that area for easy entertaining. The Cabin is entered through a sliding door with a lock. Dinette converts to a bunk to sleep two, and a couch can accommodate one. The V birth is very large which sleeps 2 and there is a shelf for a TV. The electrical panel is in the aft cabin, where two can sleep comfortably. The boat has AC/Heat, an AM/FM radio and a 10 CD changer. Mood lighting as well and ample direct lighting makes the interior very comfortable for living and entertaining. The Galley has a Microwave, refrigerator with a small freezer and a two burner stove which has never been used. There is a corner sink with overhead and base cabinets and a lighted rotated bar cabinet. The boat is in great shape and has had regular maintenance. Bottom paint was done in 2008, New zincs installed in 2011 on the rudder and the shaft. I am the third owner of the boat and the other two are personal friends so the history of the boat is completely known.